There are two schools of thought when it comes to soup. There are the people who think that soup is the perfect food, and is an end in and of itself. And, there are the people who think soup is lovely, but get to the bottom of the bowl and want to know where the rest of dinner is. I grew up in a family that belongs to the first school of thought. Except for the unfortunate black bean soup my mother made when I was in high school that was promptly dubbed river sludge soup, I’ve pretty much never met a soup I didn’t like. My mother admittedly did not think it was the best soup she’d ever had, but didn’t think it was quite as bad as my father and I made it out to be. Dinner divides fairly evenly into both camps, although I think it tends a little more towards the “and the rest of dinner is where?” side of the debate which is one of the reasons why I don’t make soup for Dinner all that often. Other reasons include the fact that soup for a large group is not as easy as it sounds, and that I don’t have a soup tureen (the fact that I have nowhere to store a soup tureen is irrelevant to this discussion). But, Dinner this week was on the small side, and it was a birthday request. I’m grabbing onto the very tail end of Summer with both hands and refusing to admit that we really are segueing into Fall, all evidence to the contrary. For one more week I’m pretending it’s Summer and I used the last of the summer corn to make soup. 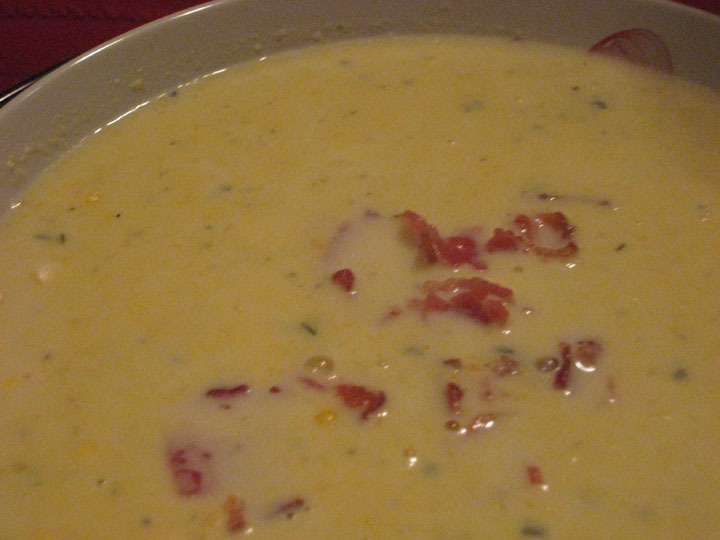 The recipe is actually called Summer Corn Soup, but I think it’s a decent transition from Summer into Fall. It’s got the delicate summery flavor of corn contrasted with the salty kick of bacon that make you think of winter stews and kicking through piles of fallen leaves. Even my roommate who firmly belongs in the second camp when it comes to soup, and usually greets soup for dinner with an expression of ‘hmmmm’ volunteered an, “amazing” followed up with an, “so good” when it came to this soup. That being said, this is not a main course soup, and if you want to treat it as such you need to supplement your dinner with a number of other things. The original recipe says it serves 6. I think it’d be skimpy for 6 even as a starter. As written I think you could serve 4 for a starter, and 2-3 as a main course if you had other things to go with it. I made a generous 2.5x the recipe and served 6 with the additions of quiche, bread & cheese, salad and dessert. The original recipe calls for you to strain the soup after you puree it. I don’t understand this at all. Firstly, I think it would taste like flavored milk if you strained it, and I’m not all that fond of milk to begin with, much less slightly salty corn flavored milk. 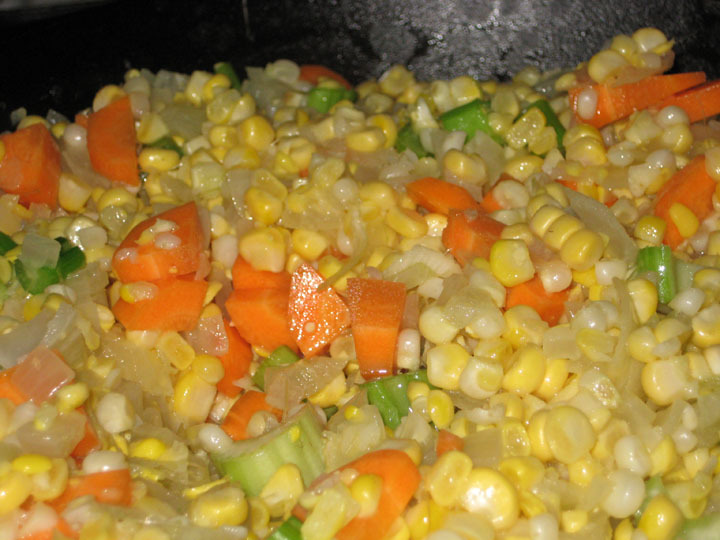 Secondly, the texture you get from pureeing the corn and vegetables gives it a nice body. It’s still a very light soup, but not straining it gives it some presence. Also, it’s a lot less work. Cut the kernels from the ears of corn and reserve. Break the cobs in half and place in a heavy pot with the milk. Bring the milk and corn cobs just to a simmer and then remove from the heat, cover and allow to steep while you sauté the vegetables. Melt butter in large saucepan over medium heat. Add onion; sprinkle with salt and sauté until translucent, about 5 minutes (do not let onion brown). 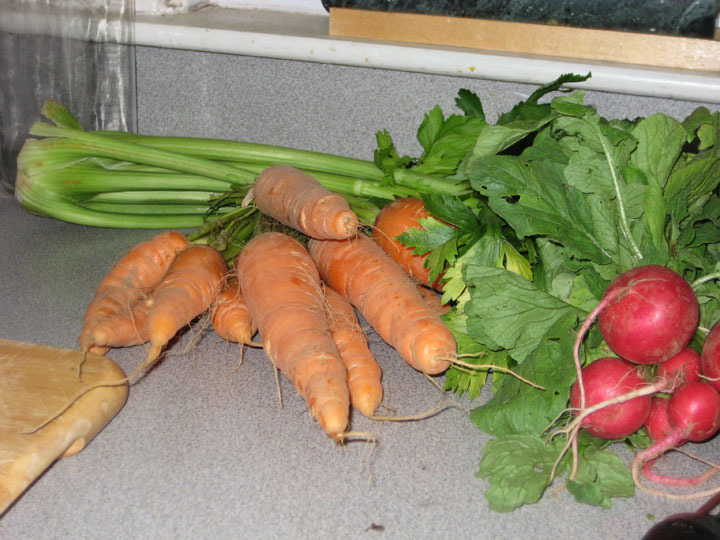 Add corn kernels, carrot, celery, and garlic; cook until vegetables are soft, stirring frequently, about 10 minutes. Add the vegetables to the corn cob/milk mixture. Add 2 cups water, herb sprigs, bay leaf. Increase heat and bring to boil. Cover partially, reduce heat to low, and simmer 20 minutes to blend flavors. Discard corncobs, herb sprigs, and bay leaf. Cool soup slightly. Working in batches, puree soup in blender until very smooth. Season soup to taste with salt and white pepper. You can make this a day ahead and chill. Bring to a simmer before serving. Cut the kernels from the corn and place about ¾-1 ear’s worth in the bottom of each bowl. 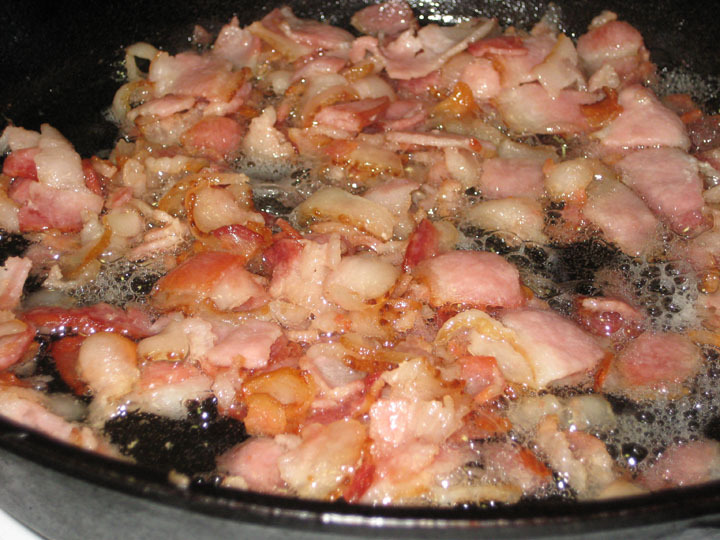 Dice the bacon and then sauté until crispy. Drain briefly. Ladle the soup over the kernels in the bowls. Garnish with bacon. One summer when I was in high school my mother came home with a flat of peaches. My father and I stared at her bemused and asked what on earth we were going to do with 42 peaches. The answer? 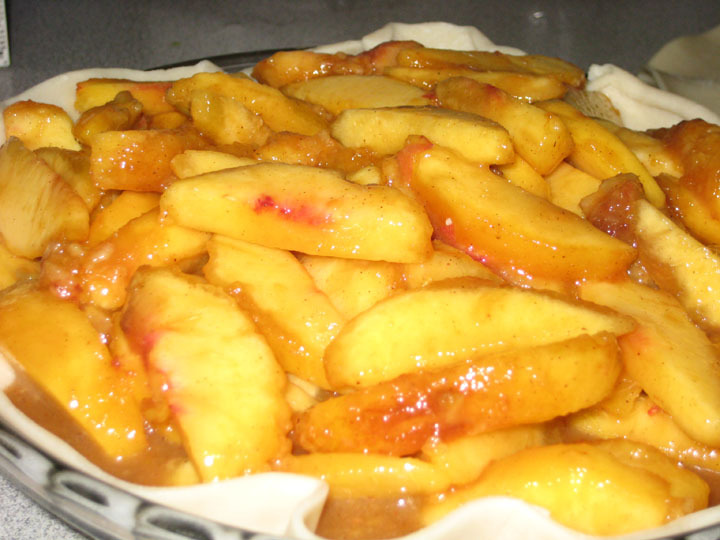 Make a lot of peach pie. We took our favorite apple pie recipe from the Joy of Cooking and changed some of the spices and used a little more corn starch, and voila! 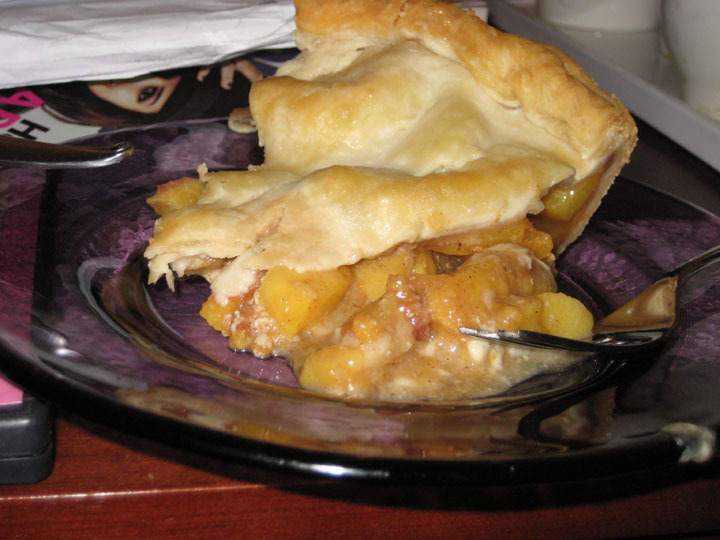 Peach Pie. Combine the peaches, corn starch, sugar and spices in a bowl. Mix to coat the peaches and allow to sit for 5 minutes to macerate. Turn into a pie shell. Dot with butter and drizzle with cream and vanilla. Cover with another pie crust. Cut some decorative holes in the upper pie crust to allow steam to escape. Bake at 450 for 10 minutes. Lower the temperature to 350 and bake for another 40 minutes. Allow to cool for 45 minutes to 1 hour (cooling it lets the filling gel, if you cut into the pie right out the oven the filling will still be liquid and run all over your plate). I like to serve it with freshly whipped cream, but technically that’s not absolutely necessary. To be strictly accurate, you did send us home with at least 2 leftover servings of the corn soup–so it might serve more people than you think. Also, that soup is THE BOMB. I’m one of those unenthusiastic soup eaters, and even I think this soup is ambrosial.